Credit Card Statement - How to Read and Understand? Home » Credit Card » Credit Card Statement – How to Read and Understand? Credit card users are generally aware of Credit Card Statement. If you are holding a credit card you must be receiving your credit card statement on the monthly basis. How many of you have practice to read credit card statement thoroughly? Perhaps, No one! In most of the cases, it is seen that credit card user look at the final amount and make payments. Even in some of the cases, people have set auto debit from the account. A habit of not going through credit card statement thoroughly can prove to be costly. There may be wrong amount, hidden charges or unknown entry. A credit card statement includes a whole lot of information. If you ignore reading bill due to lack of understanding or knowledge about terminology used in the statement, here is a complete guide about reading and understanding credit card statement. Credit Card statement contains multiple sections and terminology. A detail explanation of each section is given below. The most important thing you need to check in the statement is payment due date. The reason is late payment fee and interest are applicable if due amount is not paid by due date. 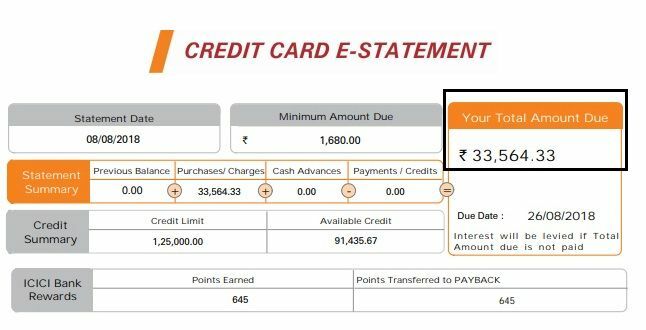 The interest amount is percentage of outstanding amount which is fixed for credit card. The late payment fee differs from bank to bank. The late fee will be charged only if you fail to pay the minimum amount due. Any failure in making payment will be recorded in your credit history and adversely affect your credit history. Statement date is another important terminology. Statement date is a date, on which credit card issuer generate the credit card statement. This date is used to calculate the interest amount if you do not pay the outstanding amount by due date. So, if interest is charged by credit card issuer and you want to tally the interest amount you can do that by using statement date. Your statement period is usually written in top most corner of your statement. Statement period is important if you want to use interest free days. Calculation of interest free day starts from first day of credit card statement mentioned in statement period. Most of the credit card statement contains credit summary section. This section provides detail of credit limit and available credit. Credit limit is maximum amount you can borrow by using this card. The credit limit is based on your income profile and your payment record. If you maintain good payment record it will help you in increasing your credit limit. Total Amount Due is total outstanding amount due on your credit card. This means it is an amount you owe to credit card company. This amount includes interest rate and all applicable fees. Transaction detail is the section which provide complete information about every transaction. All purchase and payment done using credit card will be shown in this section. It will also show you currency detail and total amount. You should look at this section carefully to spot any errors. Most of the credit card statement contains separate section showing reward points. The reward points include summary about point earned, point redeemed and point balance. You can do redemption of points on need basis. Some credit card statement also shows separate charges section. This section includes charges such as late payment fee, credit card annual fees etc. What to do in case of error in Credit Card Statement? I hope you have got fair understanding about how to read and understand credit card statement. If you identify any errors on your statement first thing you should do is contact your credit card provider to report and solve the issue. In case you find error in transactions or if your card is misused from fraudulent transactions, you should immediately block the card by giving request to credit card provider. At the end, I would like to say that You might be thinking that credit card statement is an ordinary bill which you need to pay at the end or every statement period. However, it’s important to go through credit card statement thoroughly to find out error if any.